Adding tights to a dress can completely alter the look of the ensemble, proving the sartorial power of this versatile accessory. With their warming capabilities and flattering shape, it's no wonder they are a go-to for fashionistas everywhere. From bold and bright hues to simple neutral textures, tights when worn with dresses and shoes is a polished, put-together look appropriate for a wide range of occasions. Keep in mind a few basic fashion rules when utilizing this sleek add-on. While pairing tights with a chic dress and shoes, fashion rules dictate that you avoid styles that will showcase your toes during cold weather. 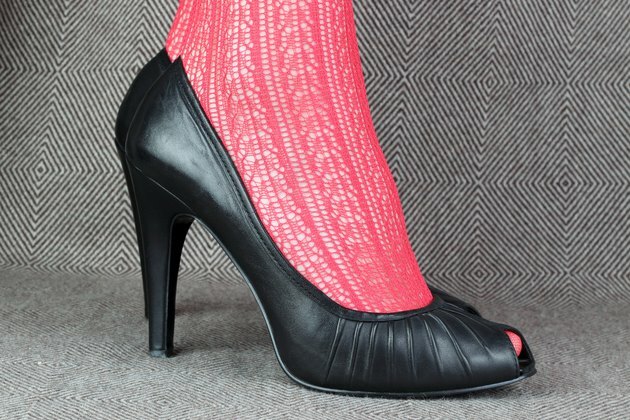 While this rule can be broken and fashionable women are now embracing the contrast of bright tights with bright open-toed heels, tread with caution. If you do choose to rock this style, stay away from tights with untidy seams and any rips. If you opt for closed-toe shoes, you'll have a myriad of options. Adorable ballet flats with tights and a floral dress is a lovely option to sport, as are knee-high boots paired with textured tights and a sweater dress. Choose tights and shoes of the same shade to elongate limbs and form a statuesque figure. For instance, pair black tights with black pumps, or grey tights with grey suede booties. Too much of a contrast between your tights and shoes could draw attention only to your feet when eyes should be focused on your fabulous dress. Avoid an awkward cut-off at the ankle by sticking to shades within the same color family. The addition of opaque black tights offers both instant sophistication and an immediate cool factor to a dress. With their slimming capabilities, this style of tights conceals lumps and bumps and is an ultra-flattering asset to your winter and fall wardrobes. Whether black, white or in a bright color like cobalt or hot pink, dresses paired with black opaque tights and fierce heels are a fashion force to be reckoned with. Tights can serve as statement pieces on their own, so go bold and bright when putting together your next dress and tights ensemble. While not for conservative events, pairing a dress in a vivid hue like chartreuse will look fabulous with an unexpected color like eggplant while mustard tights look chic when paired with neutrals like grey. Stick to neutral footwear or a pair that matches your tights, and experiment with different combinations to get the most out of your hosiery.